Amy and Clay Miller are creating a perennial, edible landscape for people, livestock and wildlife on five acres near Roland, Iowa. 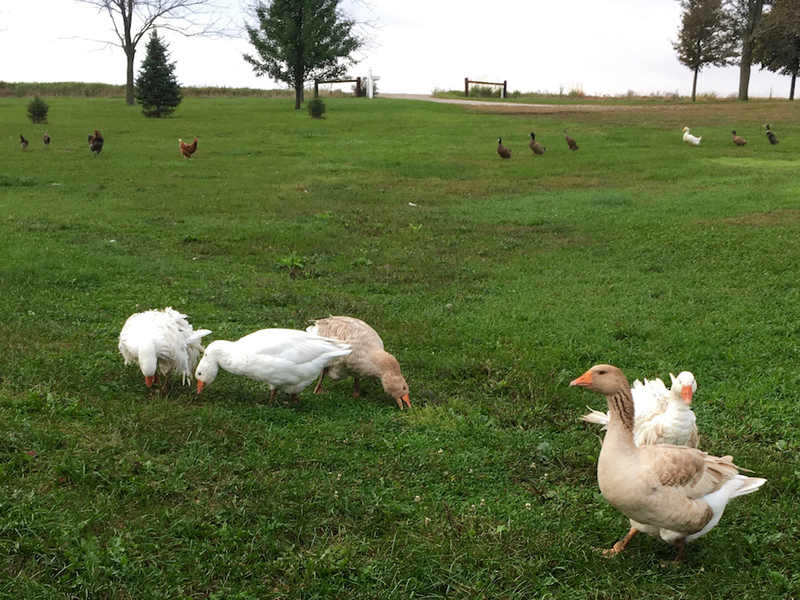 Geese (front), chickens (back left), and ducks (back right) forage for plants and insects on Clay and Amy’s large acreage. It was moving day, and Amy and Clay Miller were feeling discouraged. They were relocating from San Antonio to central Iowa in the spring of 2015 for Clay’s work, and in spite of months of searching, they had yet to find land where their dream of growing niche fruits, nuts, and livestock could flourish. 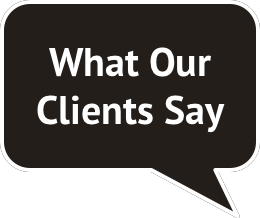 Then, the call came from a real estate agent–a new acreage had just come on the market. “It was the kind of place where we could imagine free ranging chickens, sheep, and pigs, and diverse land use in terms of both animals and plants,” explained Amy. The Millers had just moved onto the five acres of land when they attended their first Practical Farmers of Iowa field day and bumped into Luke Gran of Prudenterra. Amy noticed by the way he spoke about trees that he understood the permaculture concepts they hoped to implement on their land. Permaculture is a set of design principles for an enduring agricultural system. Taking its cues from nature, it integrates diverse, perennial plants with annual plants and livestock. Amy had studied permaculture in Texas and was anxious to let the principles take root on their farm. The Millers planted a new row of conifers that are well adapted to Iowa’s humid climate and the soil types on their farm. They are planted far enough away from the existing fence row to have space to thrive. 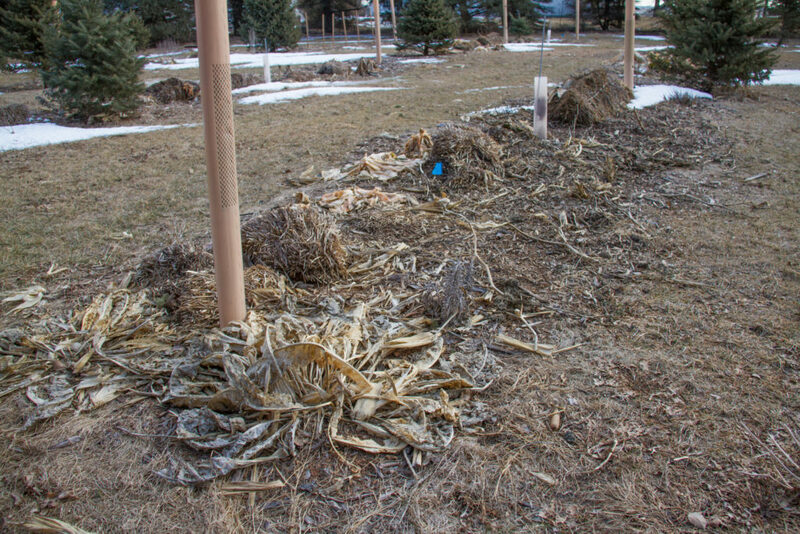 This row of perennial food plants integrates Chinese chestnuts (inside the tan tree shelters), a fruit-bearing shrub (inside the mesh protector), and smaller perennials including horseradish (bottom left), sage, and thyme. An additional shrub will be planted where the blue flag is located. 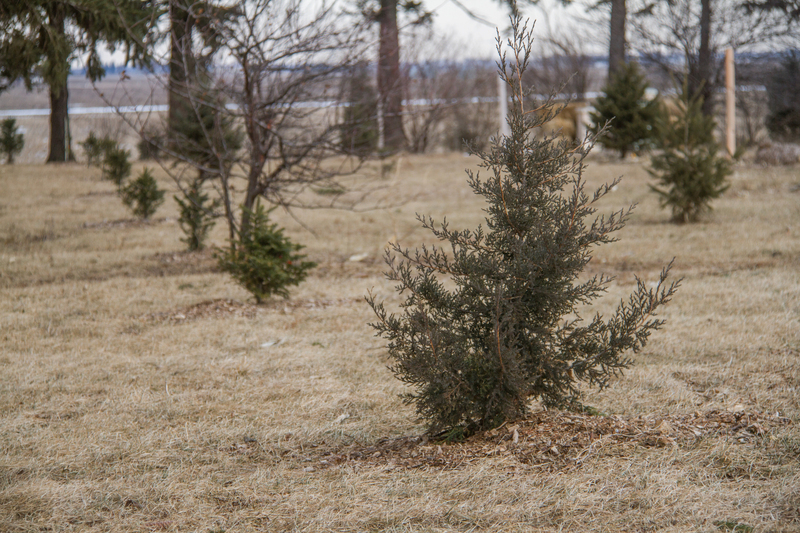 The conifers in the food forest rows were planted by the previous owner and will be removed when the fruit and nut-bearing perennials have grown larger. Amy explained that there are seven layers of vegetation within a permaculture forest garden system including tall trees, short trees, shrubs, herbs, ground cover, vines, and roots. She and Luke worked to extend these permaculture concepts (which are often conducted on a micro-scale) to the entire acre dedicated to their food forest. They started with the anchor trees, allocating one third of the the land to fruit trees, another third to Chinese chestnuts, and the remainder to traditional nut trees like pecans and English walnuts. Then, they began filling in the layers underneath the canopy with native understory shrubs such as pawpaws and gooseberries. For the next several years until the canopy closes, Amy and Clay are growing sun-loving annual vegetables and herbs between the trees and grazing and free-ranging livestock in the alleyways. In the spring of 2016, they purchased three bottle lambs from a nearby farm to intensively rotationally graze between the young trees. Using movable electric fencing, they were able to rotate them to a fresh paddock of grass, clover, and other nutritionally dense forbs such as dandelions every one to three days. It was so successful that they plan to expand to raising five lambs next year. 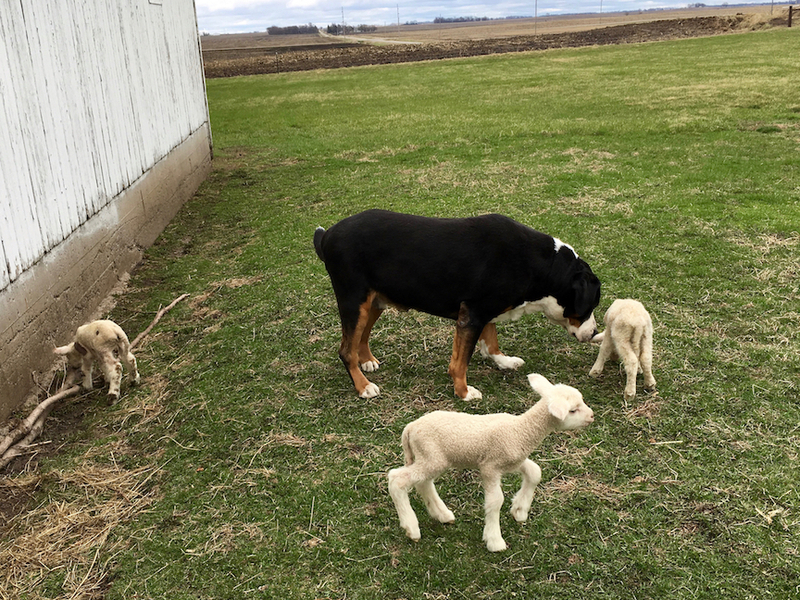 Sherlock, a Greater Swiss Mountain Dog, was very motherly with the bottle lambs. Here, he affectionately sniffs them while they are outside of the barn for sunshine and exercise. After partial weaning, the lambs transitioned outdoors to rotationally graze the forage between rows of trees in the food forest. Depending on the species of shrub or tree, it will be three to ten years before the perennial fruits and nuts come into full production. Amy anticipates that their farmstead will be provide meat and eggs for a handful of families, and bountiful, perennial produce for one or two dozen families. They may market directly to customers, or could provide an add-on share to another local farm’s annual vegetable-based Community Supported Agriculture (CSA) subscription. Value-added products may be a good way to market certain berry crops. Clay enjoys making beer and wine and has lately been making “country wines” using local fruit. Even those that are not great for drinking can be turned into high gourmet cooking vinegars. 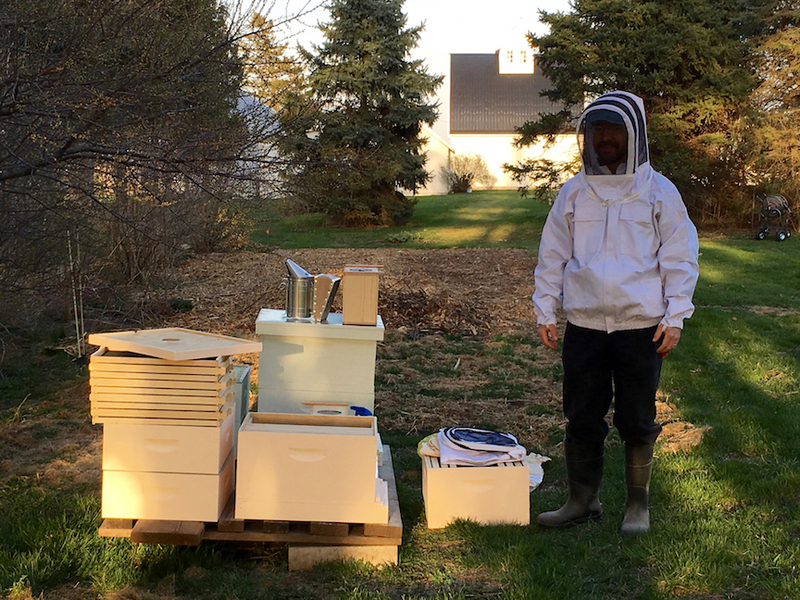 Clay is suited up to install the package bees into the hives. 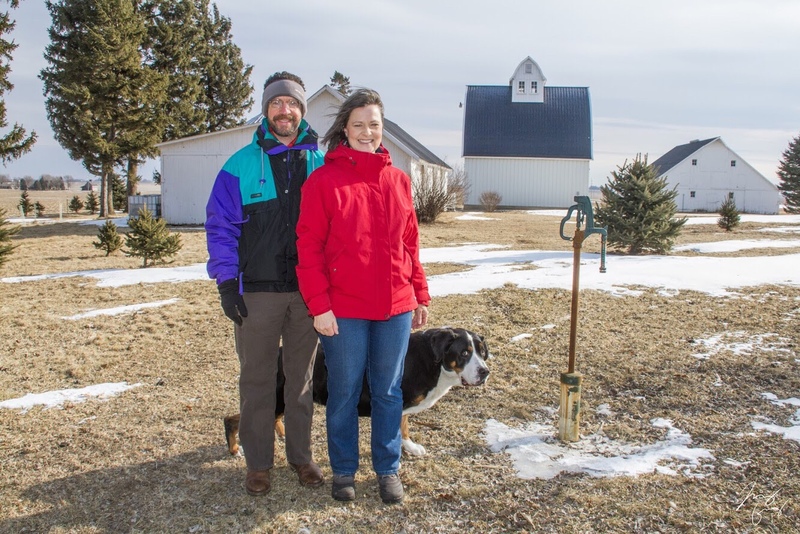 The Millers have dramatically transformed their five-acre farmstead over the last year and a half by renovating the windbreak, adding a food forest, and incorporating livestock in the landscape. At the beginning of a second full year in their new home begins, Clay and Amy are starting to see their permaculture vision take form. In a few years when the harvests become more abundant, many other central Iowa families will also be able to taste the sweet bounty of an agricultural system modeled after nature.